Those who live beyond civilization’s bounds face a daily, brutal struggle just to survive the hazards and horrors of the vast wilderness they call home. In the rolling hills and deep forests where few willingly tread, one can find all manner of hungry, violent things: from rabid animals and brutish beastmen to ravenous ogres and other terrible monsters who defy description. While the constant press of both danger and isolation often drives ordinary folks to dark and brutal acts to ensure they live to see another day, none of what these people might do comes close to the horrific deeds carried out by the two clans living in the Lonely Vale. Fine Country Folk, a Shadow of the Demon Lord adventure for a group of novice characters, thrusts the group into the midst of a deadly struggle between two twisted and murderous families who make their home in the Lonely Vale. When not fighting each other, the inbred clans of the valley waylay travelers and subject them to all kinds of hideous and cruel torments, all to further their own dark designs. The characters complete the adventure when they put an end to the degenerate inhabitants and destroy the dark force that is the source of their unspeakable wickedness. 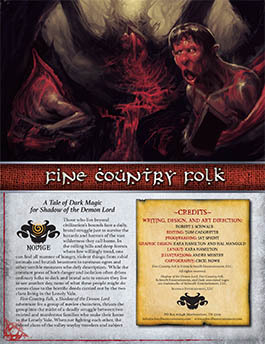 Pick up Fine Country Folk in PDF from Schwalb Entertainment or DriveThruRPG today!